NEW YORK, Sep 6, 2012/ — On the display entitled Runways to Roadways: What’s Next Presented at Mercedes-Benz Fashion Week, Mercedes-Benz and WGSN, a leading fashion forecaster, collaborated on a display at the Lincoln Center that hones in on the hottest street style looks from well-known designers and savvy tastemakers. The lobby of Mercedes-Benz Fashion Week took on the role of curator. 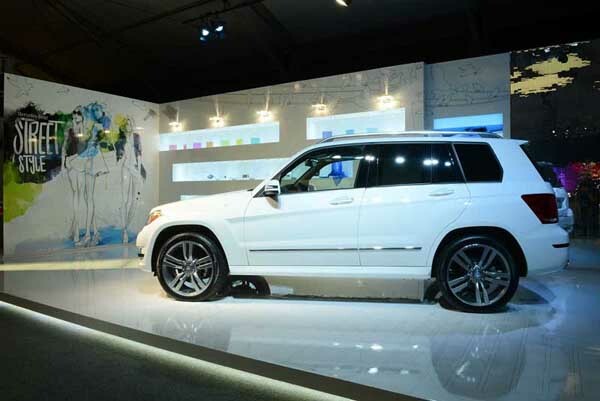 More specifically, one of the vehicle displays featuring the new 2013 GLK, the smallest in the Mercedes-Benz SUV line-up, will be surrounded by fashion designs and looks that are street style inspired. These spring/summer 2013 fashion accessories: including hats, bags, and shoes, from designers such as Jil Sander to Maison Martin Margiela, were handpicked by a community of fashion insiders at WGSN. These accessory trends are placed alongside the new 2013 GLK, which features its own bold styling persona that’s set in an agile, compact package. The redesigned interior and modifications of the GLK’s exterior for 2013 create a muscular yet elegant body that’s ready for adventure, a market trend that is permeating the fashion industry in many modes. The accessories, fabrics and color schemes chosen for the display are items that detail many of the fashion looks on the cutting-edge of both street fashion and broader design themes playing out within the industry. According to WGSN, one of the key accessory trends highlighted in the display is the sneaker sport wedge. Wedge sneakers remain a popular footwear choice, fusing classic sports silhouettes with the latest fashion-forward updates. Sports hybrid designs will remain popular worldwide as a key footwear silhouette. Some of the other top trends included in the report for spring/summer 2013 include: the sun visor, clip belt, balloon backpack and strappy adventure sandal.